Last week the members of the CSDTech Team gathered for our annual training in order to prepare for the start of the Fall semester. The CSDTech Team is in place to assist students registered with the CSD in exploring a variety of learning technologies that will help them in their courses. The team had a blast playing around with all the technology CSDTech has to offer and they are excited to begin working with our students! 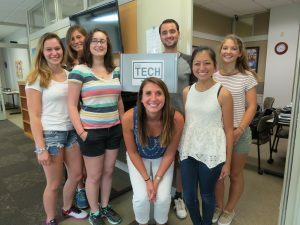 After a long summer of preparation, Alyssa Marinaccio (Assistive Technology Coordinator) and Ryan Rood (CSDTech Graduate Assistant) were excited to welcome back the team and get them ready for the best semester yet! This year we welcomed three new CSDTech Team members: Amanda Lor (Senior), Kelsey Butler-Waitkus (Junior) and Nancy Kuhn (Freshmen), along with CSDTech Team veterans, Amy Robinson (Junior) and Meridith Kuperstein (Junior). What are you most excited about in your new/returning role as a CSDTech Team member? What technology are you most excited to learn more about/share with our students? The group consensus here was that the Livescribe Smartpens are all the rage! Explore our website: csd.uconn.edu/csdtech to learn more about what we do and the technology we offer. 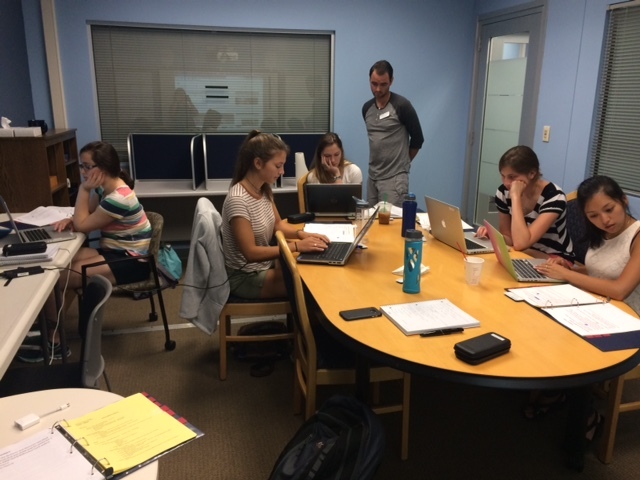 Set up an appointment to meet with a member of the CSDTech Team by calling 860-486-2020 or emailing csdtech@uconn.edu. Stop by! We accept walk-ins during office hours (8:00 am – 5:00 pm). Our office is located on the second floor of the Wilbur Cross building.